"That old cow is finally dying. No one likes the grandma in your family, the only thing she has going for her is her crazy fortune. You and your family have to act perfectly, solve her problems and fulfill her random caprices for 14 days, that’s how long the doctor said she has left. Since you are all super greedy and don’t want to share the will, it won’t be easy to win. Stepping on toes, mocking and annoying each other and only trying to be perfect for the grandma. You have to climb her ladder of love the fastest." "In ‘Fury Road the Board Game’ you will experience the thrill of fast and deadly vehicle combat. You will face off against opposing drivers, and overcome the dangers that await on the Fury Road. As a driver, you will be able to customize your unique vehicle with a wide arrange of weapons and gadgets. Both you and your opponents will become more powerful, increasing the stakes with every move. 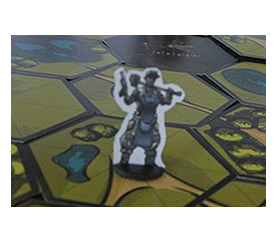 'Fury Road the Board Game’ uses a unique board and tile mechanic that gives the game a constant feel of motion and speed." "In this fun party game you have to scare the living daylights out of you friends. It is a game in which you come up with scenarios and haunt your opponents. Welcome to ‘Ghost Tales’! It is a simple game, whenever someone enters a room they get haunted and the others need to scare this person, each scenario is unique depending on the cards in the players hands and their imagination." "In this asymmetrical board game, you take the role of villager in the city of Vitis, but whether or not you are still in your right mind, is up for debate. Play either as a citizen, running for your life in search of rescue, or terrorize the night as a werewolf, unhindered by fear and in search of a next meal. Go through the map with movement dice, collect items to aid you in this night, or draw cards that will hinder your opponent in interesting ways. Find the Key. Run to the safety of hallowed grounds in the church, or become a tasty snack." "You are a hacker trying to move his package as fast as possible to its destination. But you are not alone! Work together or sabotage, only the result matters. Conveyor is a game where secrecy and strategy are essential. Try to keep the number of your package hidden by making strategic moves. The game is easy to understand and aimed at casual players with play sessions ranging from 10 to 20 minutes." "An adventure on the ever-shifting seas of (Epic place name)! Sail and discover adventures on every turn you make. Gather mighty artefacts battle fears creatures, survive pirates, help others, and find the treasure that will surely change the world." terrible arena. You seek a way of escaping their grip. In this game you will do fierceful arena battles and find ways to empower your character with bionical limbs and twisted weapons. Who will be the one to hit puberty first and break free?"